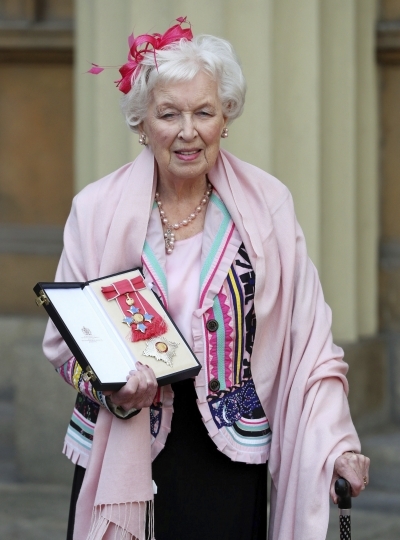 LONDON — British actress and comedic star June Whitfield, whose long career included memorable roles in TV series "Absolutely Fabulous" and "Terry and June," has died. She was 93. "I will always be grateful that she agreed to be in Ab Fab and even more grateful that she became a dear friend," Saunders said in a statement. "She lived and worked with an extraordinary grace." Lumley said she was "heartbroken to lose such a darling friend." Whitfield's father was a telephone company executive and her mother an amateur actress. She once told The Telegraph newspaper she knew very early in life she wanted to be a performer. "There was never one moment when I decided," she said. "I went to dancing classes and elocution classes and the appeal was simply that I loved it all." She trained at London's renowned Royal Academy of Dramatic Art and started her career in radio comedy in the 1950s, moving into TV as the new medium eclipsed radio. She received dozens of honors, including being made a "Dame," the female equivalent of a knighthood. She received the honor from Prince Charles in a Buckingham Palace ceremony in 2017.